Hamburg America Line’s Imperator was launched on 23 May 1912 at Hamburg’s Vulcan Werft shipyard. Imperator entered service as the world’s largest ship. The 52,117 GRT vessel was 906 feet long and 98 feet at beam. The three-funnel liner, with a rated service speed of 24 knots, was powered by four steam turbines. She could carry up to 4,234 passengers (908 first class, 592 second class, 962 third class, 1,772 steerage) and 1,180 crewmembers. 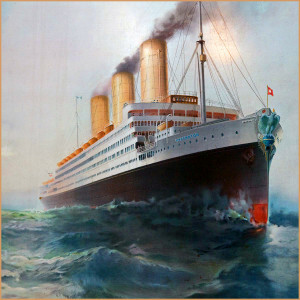 Imperator’s launch, which took place just five weeks after the Titanic disaster, followed a series of rapidly made safety-inspired changes to the vessel’s hull design and on board equipment. More changes would be made in the months ahead. She made her maiden voyage, Cuxhaven to New York, in June 1913. An unforgettable Imperator feature was the bronze eagle figurehead that adorned her forepeak. The eagle clutched a globe featuring a banner with HAPAG’s motto: “Mein Feld ist die Welt” (translated as “My Field is the World). The eagle’s wings were lost in 1914 during in an Atlantic storm. The figurehead was subsequently removed and never reinstalled. During World War I Imperator lay protected on the river Elbe, near Hamburg. At the war’s end, Allied occupation forces found a liner that was rusted, decaying and literally stuck in the mud. 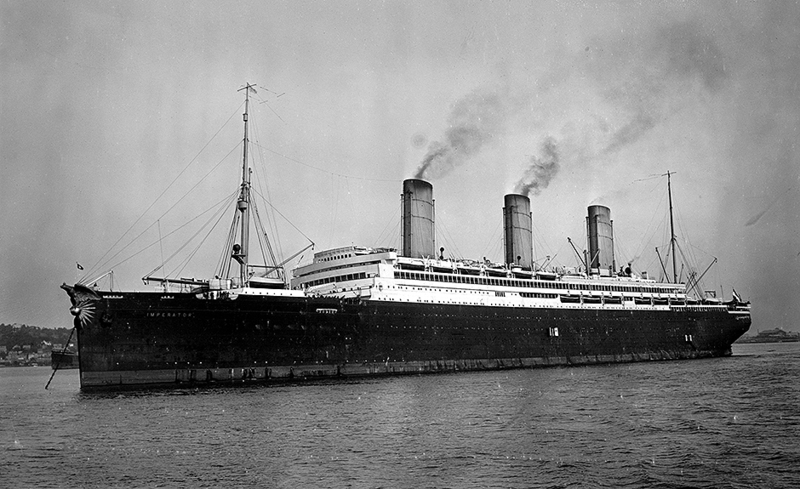 After serving as an allied troop transport until August 1919, Imperator was transferred to Britain and, ultimately, handed over to Cunard Line. Retaining the name Imperator, she made her first voyage for Cunard on 11 December 1919, from New York to Southampton.